Members of Rapid Action Battalion (RAB) in separate drives arrested nine people on different charges from separate places here on Thursday night. Among the arrestees, three- Shahjahan Mia, Khokon and Mukul-were arrested in a murder case. Tipped off, a team of RAB-1 conducted a drive at Bhauraid Uttar Para and arrested Shahjahan for killing his wife Afroza Begum, 26, from Bhauraid area, said Sarwar Bin Kashem, commanding officer of RAB-1 at a press briefing in the city. he used to engage in quarrels with his wife . On January 3, the couple locked into an altercation and at one stage, Shahjahan strangled Afroza to death over the issue, said Rab. Later, he dumped the body into the septic tank of his house with the help of this friends Khokon and Mukul in exchange of money. 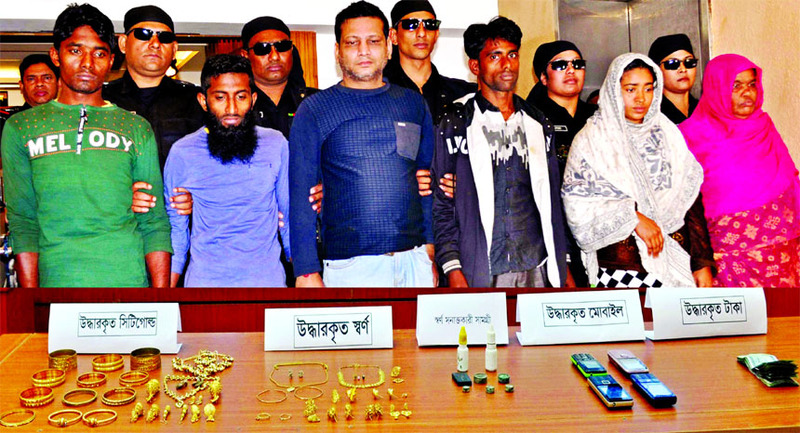 Besides, the RAB members arrested six members of a 'robber gang' from different parts of the district.